Earlier this season, there was a disagreement between Adrian Beltre and myself about how long I was permitted to remain in the visiting clubhouse at Progressive Field. I was there waiting on one of Beltre’s teammates (now ex-Ranger Jonathan Lucroy). The rest of the modestly sized media contingent had departed and the media-relations representative was nowhere to be found. I was the last reporter remaining. Beltre asked from his locker about 20 feet away why I was still in the clubhouse. He suggested I leave. I motioned toward the time on the wall-mounted digital clock and explained I had a few minutes remaining. I have rights as a BBWAA card holder! He disagreed. Feeling outnumbered, feeling now as something of a trespasser — and preferring to fight another day and over something more significant — I attempted to depart the clubhouse with my dignity. Hey, I get it. Players don’t want reporters in their space any longer than they have to be there, and I think I speak for most reporters and bloggers in saying we don’t want to be there any longer than we have to be. As a reporter, the magic of standing in a major-league clubhouse is soon lost. At least in my experience. But we’re often there, standing idly, as we wait for a specific player or coach to become available for an interview. So much of beat reporting, and occasionally FanGraphs reporting, is waiting. Our purpose is to connect the broadcast-watching and ticket-paying public with the players and teams in whom they’re interested. I assume that Beltre, the most prominent veteran in the Texas clubhouse, was merely looking out for his teammates, trying to clear the clubhouse of the lingering distraction. Or maybe after roughly 12,000 career plate appearances, he has tired of unfamiliar reporters. This is the only interaction I’ve had with Beltre. And despite the minor inconvenience, I have immense respect for his body of work. Not only is Beltre on top of his game as a clubhouse policeman, what’s remarkable this year is that, at age 38, in what’s supposed to be the twilight of his career, the future Hall of Famer has never been better — at least as a hitter. While his season was delayed by injury, the 145 wRC+ he carried into play on Wednesday represents the second-best single-season mark of his career. And among players age 38 and older with at least 300 plate appearances in a season, it’s the 21st-best mark since 1903. If David Ortiz’s 2016 season hadn’t occurred so recently, perhaps we would be taking greater notice of Beltre’s campaign. What’s remarkable about Beltre, to me, is how consistent his skill set has remained at a time when the game has become so extreme. 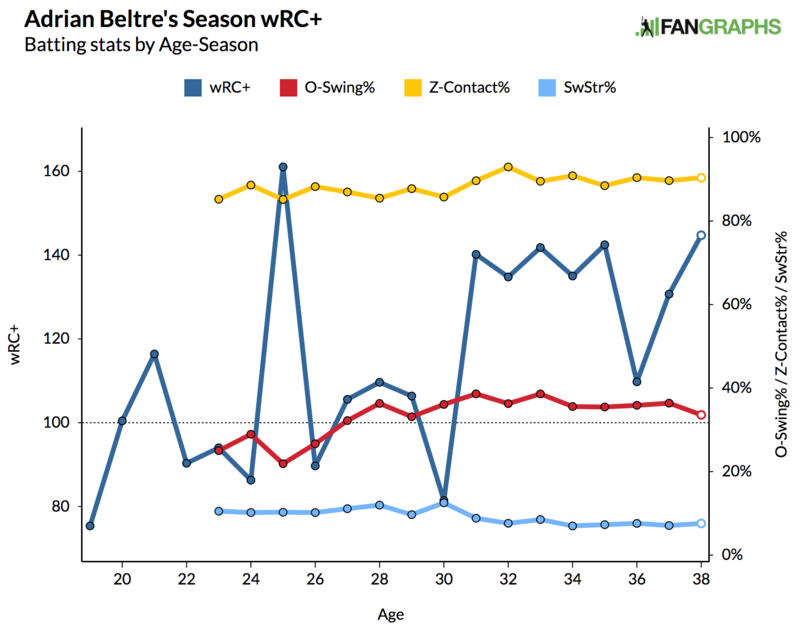 Consider the changes Beltre has seen in the second half of his career. Pitchers’ velocities have increased every year in the PITCHf/x era. Breaking stuff has benefited from the result of increased arm speed. Bullpens have become more specialized. And yet, here are Beltre’s swinging-strike rates from the last seven seasons: 7.6%, 8.5%, 7%, 7.3%, 7.6%, 7.1%, and 7.5%. The pitchers haven’t been the only variable to change, as the scouting material has grown on hitters exponentially, as have defensive shifts. Yet, here are Beltre’s wOBAs over the last seven seasons: .381, .388, .379., .380, .337, .371, and .394. Beltre is aging quite gracefully. Only 23 players since 1903 have produced more WAR at age 30 and beyond than Beltre, and Beltre is playing like he still has plenty left in the tank. With 10 more wins above replacement, he will pass Nap Lajoie to become the 12th-most productive player after age 30. If he can produce 11.4 more wins above replacement, he will crack the top 10 and leap Mike Schmidt and Joe Morgan. It’s unclear for how long Beltre will continue to play. He has another year remaining on the two-year, $36 million extension he signed last season, a deal that could very well produce surplus value for the Rangers. He could enter free agency at 40 in the same class as Bryce Harper, Manny Machado, and company. And while he would perhaps be the oldest player in the class, he’s an outlier who could still create significant value. Everyone slows down, eventually. Beltre presumably will, too, if he plays long enough. 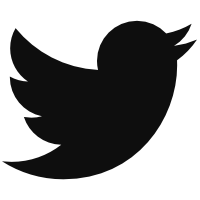 But there are few signs to date of a downturn. Even his defense at third base is still well above average. He’s had one of he best second acts of any player in history. By some measures, he’s never been as effective per plate appearance as he’s been in 2017. And even as someone who’s been bounced from a major-league clubhouse by Beltre, and perhaps unjustly so, I, as a 37-year-old, still have immense respect for what he’s done with his 30s. We hoped you liked reading Adrian Beltre Is Never Getting Older by Travis Sawchik! Sorry for the bluntness, but what exactly is the point of the 1st 3 paragraphs? After those I think you have a great article here, I’m just not sure why as a journalist you need to inject yourself into the story. To add some levity and a personal touch? Eh, it’s a pretty mundane story that adds nothing to the rest of the piece. Sorry for the bluntness, but what exactly is the point of this comment?